If you would like to get your spring yard clean-up off to a QUICK and AMAZING Start this Spring, we’ve got a 3 Step Spring Yard Clean-up Edmonton Checklist to help you cover the essential basics. 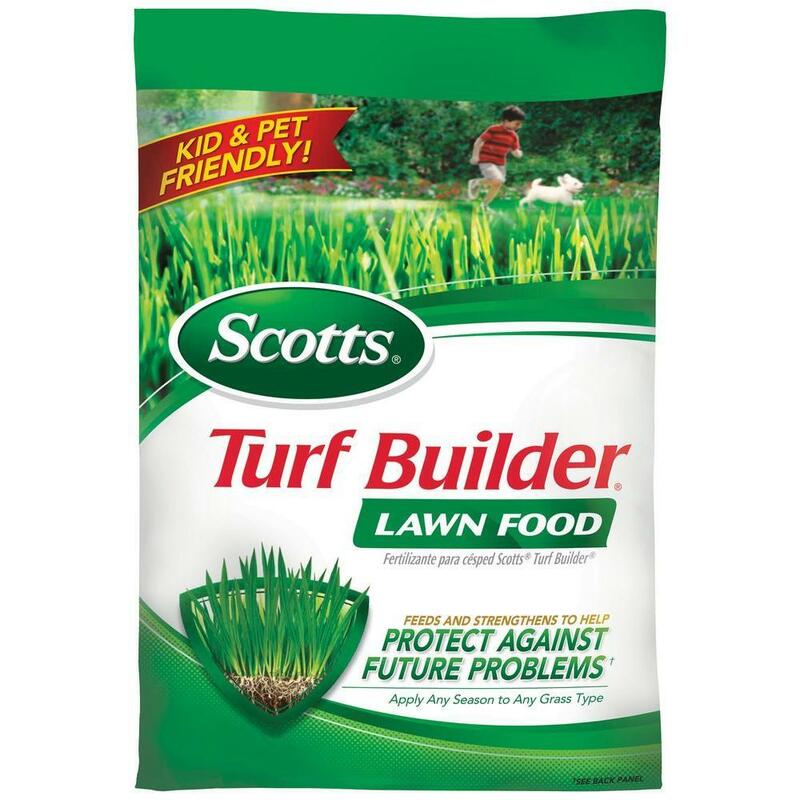 the quicker your grass will grow and the healthier it will become! Something else you should know… as lawns age and sustain heavy use from play, sports activities, foot traffic, pets and heavy build-up of snow and ice over the course of the harsh winter months, the topsoil directly beneath the grass becomes compacted and extremely hard! When the soil becomes hard and compacted, it prevents the grass from receiving everything it needs in order to thrive. In order to ensure that your grass is receiving the essentials such as water, oxygen and nutrients, it is essential that you Core Aerate your grass at least once per year. By doing so, this will allow rainfall (or irrigation) to infiltrate and reach the soil beneath the root base of your grass. If the soil is hard and compacted, water tends to runoff instead of penetrating the soil. 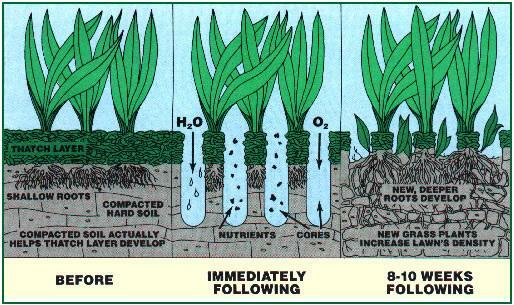 Core Aeration also enhances oxygen levels in the soil and allows nutrients found in rain water and fertilizers to penetrate the soil, all of which will stimulate and promote root growth. As a result of a healthier root base, your grass will become more tolerant to drought as the roots will be able to pull moisture from deeper beneath the surface, resulting in a thicker, healthier and lush lawn all year long! 2) Edmonton Power Raking – What is “Thatch” and do I need to remove it? As a result of our extremely harsh Edmonton winters and the prolonged build-up of snow and ice over the course of the winter months, a thick layer of dead grass (Thatch) lies directly in the path of any new shoots that will want to show their faces in the spring. The Thatch acts like a thick heavy blanket, as it prevents and hinders the new shoots from germinating and flourishing. If you don’t believe me… just throw a heavy blanket on your lawn and leave it for a week. When you lift the blanket you will be greeted by… “YELLOW and ENEMIC” looking (dead) grass!! What’s the BEST way to remove the Thatch? For the best results, Power Raking is the BEST way of removing the Thatch. Special “De-Thatching” machines have blades called “Flail Blades” that are attached to the bottom of the machines and are specifically designed for this purpose. As the machine moves across the grass the Flail Blades “slap” the ground, lifting and dropping the Thatch on top of the grass where it can be hand raked and bagged. After the bulk of the Thatch has been bagged (and there will be a ton of it), you can then use a (Hi-Vac) lawnmower to vacuum up the balance of the loose Thatch. Should I clean-up all those leaves? Collecting and bagging leaves from last fall is essential if you want to get your Edmonton Outdoor Space ready for the summer! If the leaves are left on the lawn they will also create a blanket, which will also impede the germination of new grass shoots. Chasing leaves out from your tree and shrub beds will also improve the overall look of your yard, but they can be challenging to chase out depending on the type of ground cover (wood bark or decorative rock) that you have. In order to do a good job of chasing out and collecting all those leaves, we recommend hiring the services of a professional landscape contractor. They utilize high powered (backpack) blowers that will chase out the leaves from the tightest of corners. Once the leaves are out in the open they can easily be raked and bagged along with the Thatch. We cannot stress the importance of applying fertilizer in the Spring, followed by ongoing applications during the growing season. If you do, your lawn will become thick and lush and will be the envy of your neighbors! 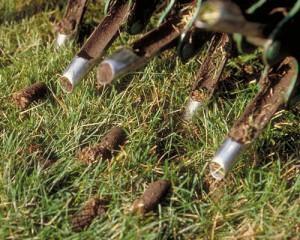 The best time to apply the first application is right after you have removed the Thatch and Core Aerated your lawn. This is typically performed after the grass has started to show signs of life. With that said, the question of whether to fertilize at all is a subject of pretty intense debate, as the following discussion will make clear. The question of whether or not a lawn should be fertilized generates a lot of debate, based first of all on where you stand on the organic/low impact-to-chemical spectrum. Organic gardeners who bemoan the use of any and all chemicals would say that fertilizing a lawn really should not be done at all—or if you do it, you should take great pains to apply it sparingly so as to avoid the possibility of any kind of fertilizer run-off into water supplies. There is good evidence to support this position, as contamination of streams, rivers, and groundwater supplies by the phosphorus and nitrogen found in lawn and agricultural fertilizers is becoming a severe problem. So much so that some municipalities have banned certain types of “Weed” and “Weed/Feed” products from being sold over the counter. For most of us, the desire for a really nice thick and lush green lawn is such that we’re willing to apply at least some fertilizer to our lawns. There are ways to feed a lawn safely. 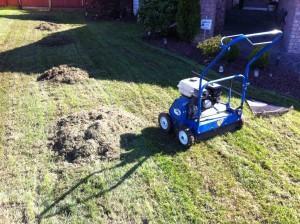 First, you can choose to use a mulching mower that chops up grass into fine particles that then break down on the lawn. Horticultural experts say that over the course of the season, this technique provides a lawn with as much nitrogen as one complete application of lawn fertilizer. This also helps to keep the grass clippings out of the landfills. If you choose to initiate a “mulching” program, you need to be prepared to cut the grass at least twice per week. If not, the grass becomes too long and when cut it will turn to straw when it dries out. This is both “unsightly” and “counter-productive” as the grass will sit on top of the grass and will not find its way down to the root base where it needs to be. There are fertilizers that are “truly organic” in nature, made from natural materials rather than refined chemicals. These organic fertilizers (they will be labeled as such) will indeed feed your lawn just fine, though they are somewhat less saturated with the key nutrients such as “nitrogen, phosphorus, and potassium”. 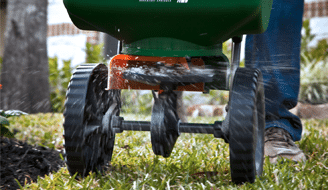 Many people opt for a traditional “chemical lawn fertilizer”, the type that is readily available at hardware stores, big box home improvement centers and garden centers. Manufacturers of these products do a good job of identifying the appropriate use of these products, adjusting their mixes for the different seasons. You will find products specifically blended for early Spring, Summer and late Fall, so be sure to read the product label before you purchase. Where you should question the fertilizer manufacturer’s recommendations is in the quantity and frequency of application recommended on the label. Fertilizer packages are a little excessive in the amount of fertilizer they recommend. This is understandable, as they want to sell product and have a vested interest in seeing aggressive applications of fertilizer. So review these recommendations carefully. Fact is – A healthy lawn will be a fairly light shade of bright green. If you see a lawn that is a deep, almost blackish green it is likely because it has been very heavily fertilized. The “dark green” comes from lots of nitrogen on the lawn, some of which has probably already made its way into the streets, storm sewers and then into streams and rivers. What’s the BEST time to perform a Spring Clean-Up in Edmonton? The BEST time is right after the snow and ice has melted, after the frost has come out of the soil and the grass and soil is dry. Based on many years of providing Spring Clean-Up Services in Edmonton, this can be anywhere from the second week in April to the second week of May. The timing will ultimately be driven by the amount of snow and ice pack we received over the winter and ground conditions. Please note: in order to achieve the BEST results, the grass MUST be dry! If it’s too wet the Power Raking will rip out the grass roots leaving you with a lawn that looks like your yard was host to last year’s Super Bowl. I have personally witnessed many disasters as a direct result of contractors that didn’t know what they were doing or wanted to start the process waaaay too early! In summary… if you implement an effective Edmonton Spring Clean-Up program and fertilize and water your grass throughout the growing season, you will have a thick, lush and healthy lawn and one that will be… the envy of your neighbor’s! We trust this article was both informative and educational? Should you have any questions or if you would like to Schedule Spring Clean-Up Services, we would love to hear from you!